Direction for use Read label before use. Using the bottle cap as a dispenser, add the recommended tablet dosage to the recommended quantity of water and allow to dissolve. Once made up keep away from children and use immediately. To remove cap: Place bottle on a firm flat surface. Squeeze grips on cap and turn anti-clockwise. To replace cap: Place bottle on a firm flat surface. Replace cap and turn clockwise until a click is heard. Check the cap is closed. 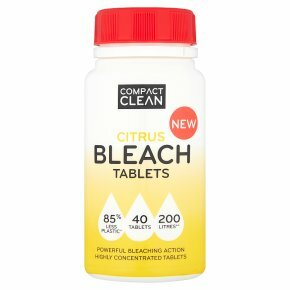 Thin Bleach: To create a thin bleach, add 1 tablet to 5 litres of water and allow to dissolve. Kitchens: Add 2 tablets to 10 litres of water. Clean surfaces and floors with the solution. Leave for 15 minutes, then rinse. Bathrooms: Add 2 tablets to 10 litres of water. Clean surfaces and floors with the solution. Leave for 15 minutes, then rinse. Soaking/Stubborn Stains: Wash garments in cold water. Then add 2 tablets to 10 litres of water. Soak garments for 5 minutes then wash as normal. Toilets: Drop 1 tablet directly into the toilet bowl. Leave for 5 minutes. Clean with brush. Leave for 5 minutes then flush. WARNING<br>Contains: TROCLOSENE SODIQUE, DIHYDRATE (CAS 51580-86-0) and ADIPIC ACID. Harmful if swallowed. Causes serious eye irritation. May cause respiratory irritation. Very toxic to aquatic life with long lasting effects. If medical advice is needed, have product container or label at hand. Keep out of reach of children. Read label before use. Avoid release to the environment. Wear protective eye / face protection. IF SWALLOWED: Immediately call a POISON CENTER or doctor/physician. IF IN EYES: Rinse cautiously with water for several minutes. Remove contact lenses, if present and easy to do. Continue rinsing. If eye irritation persists: Get medical advice/attention. Store locked up. Store at temperatures not exceeding 50°C. Store in a closed container. Dispose of contents/container in accordance with local regulation on waste disposal. Contact with acids liberates toxic gas. Warning! Do not use together with other products. May release dangerous gases (chlorine).<br><br>Warning Rinse hands after use. People with sensitive or damaged skin should avoid prolonged contact with the product. Do not ingest. If product is ingested immediately seek medical advice. Do not change container to store contents. Do not use on any metals or enamelled baths. Do not use on fabrics which have the 'Do not bleach' symbol, or are wool, silk, or have a special finish. Do not use on furnishings or carpets as damage may result. Always wipe up any spillage immediately and rinse affected areas with clean water. This product is not suitable for sterilising baby feeding equipment. Do not use undiluted anywhere except in the toilet bowl and in drains. For man-made work surfaces, follow manufacturer's cleaning instructions.